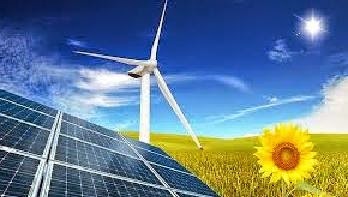 Under the Expansion, Growth and Diversification business strategy of the company, SJVN has signed a MoU with Hindustan Salt Limited to Conceptualize, Structure, Implement, Operate and Maintain the Ultra Mega Hybrid Renewable Energy (Solar & Wind) Park at Salt Pan Land in Kharaghoda, Gujarat. This proposed park will be developed on the surplus salt pan land of Hindustan Salt Limited which has the generation capacity of 4000 MW to 5000 MW (Solar Power between 3500 - 4200 MW and Wind Power between 600-800 MW) when fully commissioned. At the initial stage, SJVN will develop all the infrastructure facilities like roads, drainage system, power supply, water supply system, evacuation arrangement from the plot to evacuation sub-station. The MoU was signed by SJVN CMD R P Singh and HSL CMD A K Jain at SJVN's Coordination Office in New Delhi. SJVN is already operating India's largest 1500 MW Nathpa Jhakri Hydro Power Station, and another tandem based (with NJHPS) 412 MW Rampur Hydro Power Station in Himachal Pradesh. Presently, SJVN has installation capacity of around 2000 MW from all the three operative projects. On this occasion, Executive Director (BD&MS) R K Agarwal and other senior officials were also present. Mr R P Singh informed that SJVN is already in the process of setting up a 5 MW Solar PV project in the prestigious Charnka Solar Park at Gujarat. The project shall be established in an area of 1,00,033 sq. mtr. allotted by M/s. Gujarat Power Development Corporation Limited for this project. On commissioning the project will generate 8.10 million units of clean and green solar energy. In line with National Solar Mission, SJVN Limited has signed a MoU to develop and operate 4000 MW Ultra Mega Solar Project in Sambhar area of Rajasthan. SJVN is one of the six joint venture partners having 16 per cent equity participation in the proposed mega project. SJVN will carry out designing of layout, civil structure, project management consultancy, monitoring and owner's engineering supervision of erection and commission for this project. Mr Nand Lal Sharma, Director (Personnel), told that SJVN has already entered the field of Wind Energy with the development of 47.6 MW Khirvire Wind Power Project in Ahmednagar district of Maharashtra. The project is fully commissioned and generating Wind Energy from all of its 56 Wind Energy Turbines of the capacity of 850 KW.